Adrian Thompson, LRC Manager at Laisterdyke Business and Enterprise College in Bradford spent two weeks of his summer holidays on the Book Bus in Zambia. It was an experience which had a profound effect on him, and he writes about his experiences here. The children in the purple uniforms are from Victory school. 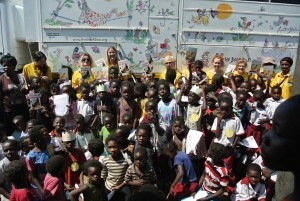 Over the summer, I spent two weeks working with the Book Bus project in Zambia. Book Bus have several projects currently operating in Zambia – they’re in Livingston, the UNHCR Refugee camp at Meheba, and their newest project – the one I was going to – in Mfuwe in the South Luangwa Valley. The South Luangwa is pretty remote, even for Zambia, and getting there was quite a trek – Manchester to Munich, Munich to Johannesburg (flying over Zambia on the way! ), then back to Lusaka before leaving the comfort of big jets behind to hop onto a tiny plane to fly to the airstrip at Mfuwe. I was met there by a safari truck from Croc Valley Camp, and off we bounced for a spectacular half hour drive down dirt roads to the camp. 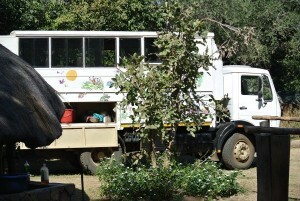 Arriving, I met Sarah, the Book Bus leader (who’s there throughout the season, and maintains contact with all the schools we worked with, as well as community organisations which share Book Bus’ aims), and Douglas, the indefatigable Malawian driver of Matilda, the 1979 overland truck which had been converted into a Book Bus. 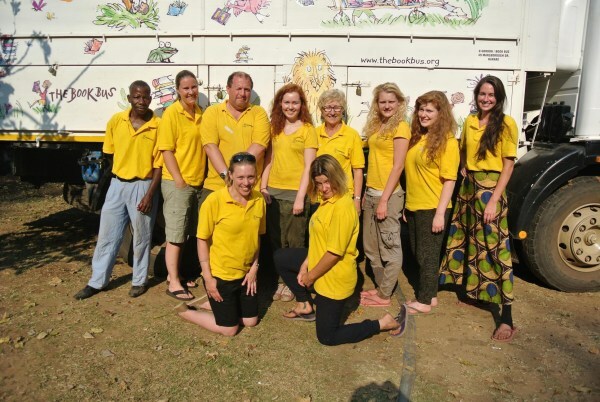 The rest of the volunteers arrived the next day – a mother and daughter from Australia, fresh from tracking Gorilla in Rwanda, two sisters and their cousin from Tunbridge Wells, a primary teacher from Leicester, a journalist travelling through Africa, and a school librarian – me! It’s about now, I should tell you a bit about the Luangwa, and the camp. 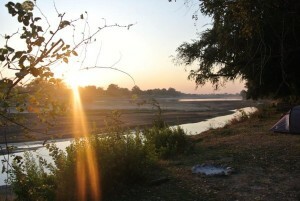 The South Luangwa National Park is on the opposite side of the Luangwa River from Croc Valley. Getting up, and out of the tent at dawn revealed a stunning sunrise, hippos bathing in the river, elephants crossing from the park to ‘our’ side, and the odd croc – and monkeys. Lots of monkeys and baboons! 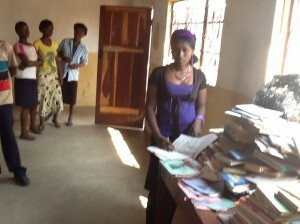 Most of the first weekend was spent preparing materials for the school we were going to on the Monday. All Sarah could tell us was the name of the school, the grade of the students, and roughly how many there were – Grade 7, 6 and 4, about 80 children per year (that’s two classes per year)… The way the sessions in school work is that you go to a school; do 4 one hour sessions – either with the same grade, or with different grades – in small groups (some schools differed – as you’ll see below!). 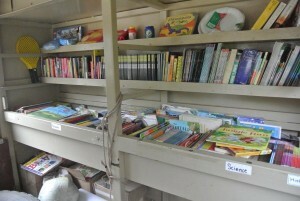 You spend 20 minutes reading to, or with, the children – either from books that are in the Bus, or that you’ve bought along, 20 minutes on some sort of comprehension exercise, to make sure they understood what you were reading, and 20 minutes on an art activity – of course, if you’re creative, you can combine the comprehension and art (It’s the art bit they like!). It’s about this time, as you prepare four lots of materials for 80 children (in total), that you really begin to miss photocopiers and computers. The first real reminder that we were in Africa (as if we needed one!) was during preparation for dinner. Having carefully diced a pile of vegetables, we were slightly surprised to see a long grey trunk snaking under the thatched roof, and proceeding to eat all the veg. We genuinely hadn’t heard anything, and didn’t hear anything as the elephant moved off. 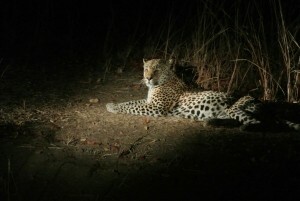 This was the first close encounter, but quickly became routine, as they wandered through camp most nights – although that was the only time they got our food! Off to Uyoba Primary for the first day. The children were great and – particularly if you’ve ended the year feeling a bit disheartened – a real tonic. Their English was pretty good (from Grade 2, they’re taught English, and from then on pretty much all their lessons and all their exams are in English), and they loved the books and the art stuff we bought with us (glitter and sequins were particular favourites!). After four hours, we left to return to camp, and start planning the next day. Day two was our first encounter with the wonderful little people at Victory Pre-school. Because of the age of the children – Victory has 55 children, aged between 3 and 6 – and the fact that none of them spoke any English – we split them into two groups, with five adults (four of us, and either the teacher, or head teacher to translate). The headmaster, James, was particularly inspiring – he effectively built the school in 2005, and runs it – unpaid – very effectively. He also has plans to enlarge it to include a Primary school in the near future. We did two activities, then played some games, and finished with a game of football (Zambia won 3-1, but since the head teacher was playing for them, and it seemed impolite to tackle him too roughly…) – and a good time was had by all. In the evening, since we were returning to Victory the next day, we had a bit more time, and went on a night safari into the National Park. Night safari’s a little bit of a misnomer, since it started in full sunshine at 4pm, but by the time we got back at 8, it was totally dark. We saw the usual suspects – elephants, hippo, genets and lots of birds – but the highlight was a female leopard lounging in the middle of the road, surrounded by Safari trucks. 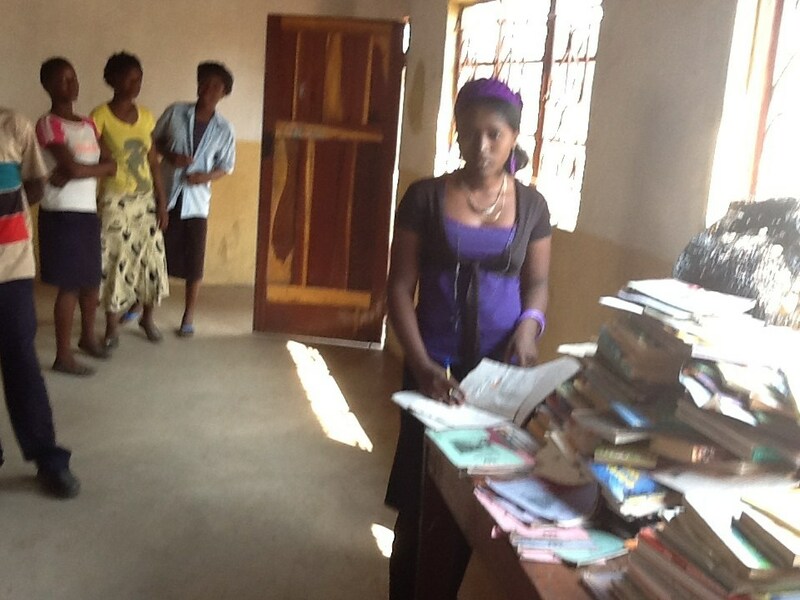 So it continued – school visits, interspersed with visits to local supermarket, the market in Mfuwe, Tribal Textiles and Just Africa, two sellers of handmade Zambian textiles and other tourist goodies, the Chipembele conservation centre, the Girl’s club at Mfuwe Day Secondary School (I was made an honorary girl for the afternoon), where we danced and sang, and listened to the girls talking about their visit to Chipata, the regional capital, the week before. 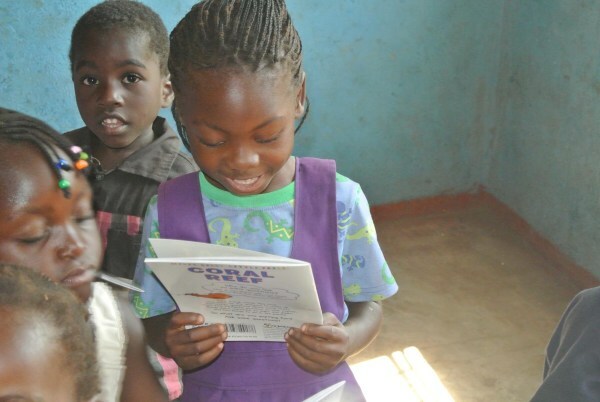 Secondary education in Zambia has to be paid for (around $240 per term, plus boarding, uniforms, books, etc), and is only available to students who pass exams at Grade 7 in Primary school. 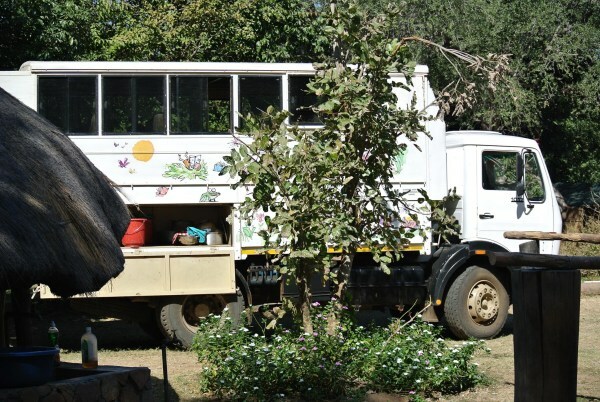 There are only two secondary schools in the whole valley – one in Mfuwe itself, and one out near the airport, and for students who live at the other end of the valley, they could face a four hour journey just to get there. It was at Mfuwe Day that we met another of the inspirational people Zambia seems full of – Malafian Chimungu, a student at the school who was paying his school fees, as well as building a house for his parents, by using confiscated snare wire to make models of animals, then selling them through safari lodges. They were astounding, and I came away with a crocodile! The weekend came very quickly, and we took full advantage – a daytime safari on the Saturday (which, unfortunately, meant getting up at 5.30am…) where we saw a pride of 19 lions eating an unfortunate zebra, followed by a walking safari on the Sunday morning (another 5.30 start). The Luangwa was where walking safaris began, and – accompanied by an armed guard from the National Park – we set off. Unsurprisingly, they don’t let you near any big animals when you’re on foot, but the access to birds, and the knowledge of the guide on tracks and animal ‘poop’ (his word) was amazing. And so, to week 2 – Monday was Farmer’s Day (a national holiday), so we went to Uyoba early, not knowing how many children would arrive. A lot did, so we worked with mixed groups, before being taken on a tour of the local village by Mrs Zulu, the head teacher. Tuesday meant Victory – again, they were on holiday, so we had no idea how many children would arrive. 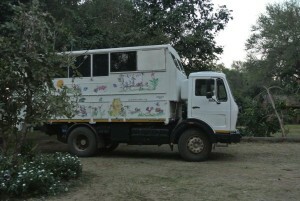 As it was, 45 out of 55 arrived, along with quite a lot of children from other schools, who were attracted by the bus. We gave all the children books, which had been donated by a publisher, and a good time – as ever – was had by all! 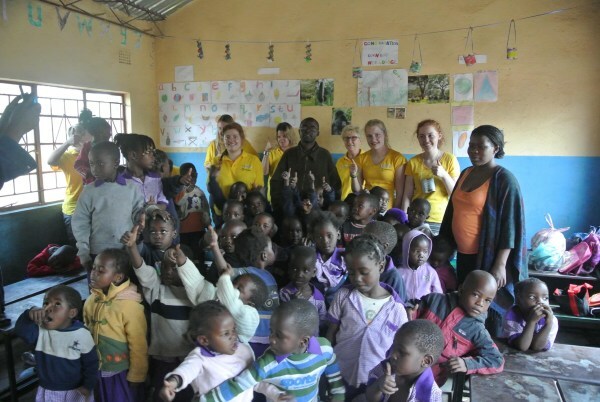 The week continued, this time featuring a visit to the furthest school – an hour along a dirt track to Kakumbi. 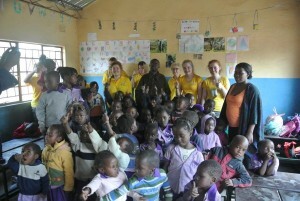 The children there were great though – committed, interested, clever and eager to learn. We also got a visit to the KK Centre – a community gardening initiative which gives free seed and advice to local people to allow them to grow their own food, which was interesting. The final school of the fortnight, Marimba, was the location of our iPad book experiment, where Cathrine (the primary teacher from Leicester previously mentioned) took two of her schools’ iPads to work with the Grade 7 students and produce two interactive books. They grasped it immediately, and produced some good stuff. The most interesting bit for me was the picture of the library at the school – the pile of books isn’t just a pile of books in the library, it IS the library. If anyone wants copies of the PDF version of the books, let me (or Caroline) know. Overall, it was a stunning, life changing, and exhilarating two weeks. Africa is as stunning and unreal as you think, People you don’t know end as firm friends, children who don’t know you end up running up to you at the market, and introducing you to their parents, everyone loves the Bus, and it takes a bit of time once you get back to get used to not being followed by shouts of ‘Book Bus!’ and waves!